"I have spent a year with my family -- with my wonderful and amazing and forgiving wife and three daughters -- and we'll rebuild those relationships, and hope to do that as time goes on." 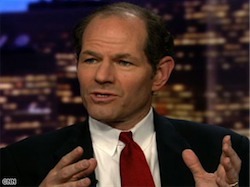 Spitzer has slowly been working his way back into public life. He started writing a column about policy issues for Slate a few months back. And he was on public radio this week in NYC talking about AIG, which Spitzer investigated back when he was New York's attorney general. By the way: The Washington Post's Chris Cilliza writes that New York's current AG, Andrew Cuomo, is "the hottest thing in politics at the moment" because of his crusade against Wall Street bonuses. And Cilliza compares Cuomo's recent rise to the career of... Eliot Spitzer. Let's just hope Cuomo can keep his socks on...or, um, off. So if I use what I know of the system to illegally move money around (in a way that would be called "laundering" if anyone else did it), then travel on official business that may well have been orchestrated just so I can have an illegal sexual relationship, but I get caught, can I also say it's just a failing in my "personal" life? He committed crimes, knowing full well what he was doing, on the clock. No rehabilitation for you! It's like two different legal systems. The people who ran the Emperor's Club are sitting in jail, and the guy who paid them gets to hang out in his Manhattan apartment without charge, and free as a bird. I'm all for legalizing prostitution, but this s.o.b. knew what he was doing full well, knew it was illegal, and had busted other people for doing the exact same thing before. The reek of hypocrisy was too strong for me to feel at all sorry for Client 9 in the least. Sounds like Cuomo is following Elliot perfectly. Sit around and do nothing while the corporations abuse the lack of regulation, then slap them on the wrists later. When that's all said and done, brag about it and become governor. Spitz even calls his failures important. What a raging ego.